On Friday, Sept. 21, we celebrate the International Day of Peace. This celebration is especially important as our kids increasingly encounter people of varying ages, from numerous cultures, and with unique physical abilities in their classrooms, on the playground, and around town. As parents, caregivers, and teachers, consider joining me this month as we teach our children to respect and embrace diversity in nine ways. It's natural for us to surround ourselves with people who look, talk, and think like us, but we owe it to our kids and ourselves to step outside of our comfort zone. Let's make a conscious choice to interact with people who are different than us and encourage our kids to do the same. For example, we can buy groceries at the international store across town or send our kids to a more diverse school. In an effort to prevent racism, we may ignore the visual and other differences we see in people. However, even babies can identify gender and racial differences. Seeing and discussing differences with our kids can remove fear and help our kids learn to appreciate and respect people who aren't the same. 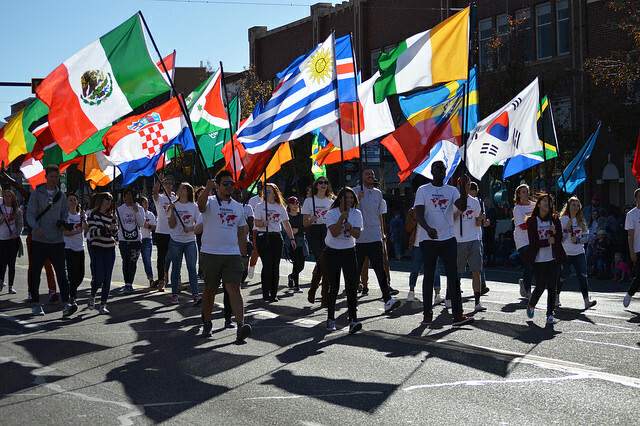 Many local communities host heritage festivals, diversity celebrations, and international musical events that celebrate the strengths and uniquenesses of other cultures. I attend and explore as many of these events as possible with my kids. I encourage them to interact with the performers, ask questions, and eat the unique foods. Through these events, we broaden our kids' worldview and increase their understanding and appreciation for other heritages and cultures. Use story time to introduce your kids to the ways they can accept, embrace, and celebrate differences. Here are a few books about diversity that my kids and I have read together. It's Okay to Be Different by Todd Parr celebrates the value of diversity. My Granny Went to Market by Stella Blackstone follows Granny through diverse marketplaces around the world. One World, One Day by Barbara Kerley shows pictures of children from around the world participating in daily activities. The Colors of Us by Karen Katz explores the fact that all people are simply different shades of the same color. The Sneetches by Dr. Seuss demonstrates that different types of people are not superior and can become friends. Why Am I Different? by Norma Simon outlines differences such as family, size, language, and hair color. We can weave diversity awareness and appreciation into our everyday lives when we meet our neighbors. That means we need to say hello at the bus stop or park. Additionally, we can share meals, play games, and help with home repairs. By interacting and building relationships with our diverse neighbors, we help our kids understand, value, and accept our rich world. Like other kids around the world, my girls enjoy playing soccer and tag. We also sometimes play different games that are popular in other countries. Play gives our kids an opportunity to connect with and appreciate kids from all cultures. When my girls' classmates or our neighbors celebrate Kwanzaa, Hanukkah, or Chinese New Year, we celebrate, too. It's educational and fun to make traditional foods and dress up in cultural clothing. We also gain firsthand insight into the values and uniqueness of other cultures through our holiday celebrations. Music is an international language. Even if we don't understand the words, we can dance to the beat, make instruments that are unique to other countries, and enjoy the sounds of music from around the world. As my girls and I have listened to international music on satellite radio or CDs we borrow from the library, we've discovered dozens of new artists and have gained an appreciation for people from around the world. As adults, we set the example for our kids in all areas, including diversity. That means we need to watch our words, attitudes, and behavior. I caught myself the other day feeling annoyed with one of our older neighbors who has a disability and takes a long time to cross the street. I had to remember that even my unspoken disrespect can cause my kids to think negatively about others. Helping kids respect and embrace diversity is a big job for parents, caregivers, and teachers. We can use these nine ways to get us started, especially as we celebrate the International Day of Peace. In what other ways do you help your kids accept others?